I am an essential and carrier oil addict. Anytime I can try a new oil for one of my natural remedies and beauty recipes, I'm thrilled. I was offered the opportunity to test and review not one, but three (yay!!) 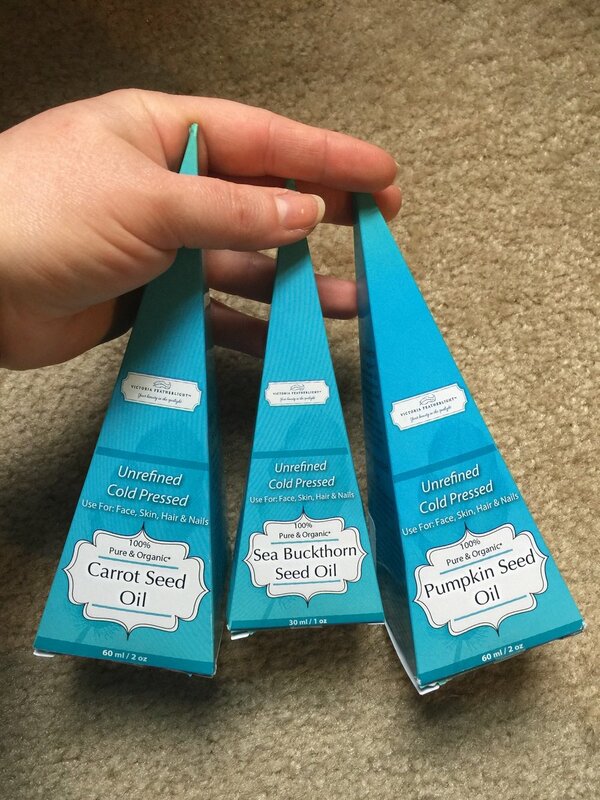 of Victoria Featherlight's newest oils in exchange for an honest review and social media posts. Although there is a website (website and social media links at bottom of post), I chose to purchase via their Amazon store due to being a Prime member. Ordering was of course simple and fast as you'd expect from Amazon. Shipment was also fast thanks to the Prime 2-day shipping. Amazon failed to send in a box, however the bubble wrap mailers and product boxes adequately protected each glass jar and dropper. Each of these oils are extracted, from their natural form, unrefined and cold pressed for the most pure concentration possible. They are also organic (currently awaiting final certification approval), unscented (other than natural aroma), with nothing added AND not tested on animals! While I'm loving all of this, the company itself seems new, but worth watching. The box indicates the product is manufactured in Chile while the distributor, Legendo Merchandise LLC (owns Victoria Featherlight) is from Israel. The boxes seemed to be faded as if they'd been sitting in the sun for quite some time, but once all three arrived, it was obvious it was instead a part of the box design where a gradient fill was used. Might be a good idea for them to remove that. Of course, I could just be picky. My reviews are honest remember? I've never heard of Sea Buckthorn. For real, what the heck is this? I did some research (1,2,3), expecting some sort of prickly ocean dwelling plant. Instead I discovered there are at least seven species of this plant, native to europe and asia. It's been used for both humans and animals medicinally and also utilized in the cosmetic industry. Sea Buckthorn (Hippophae Rhamnoides) is actually a thorny, deciduous shrub with male (flowers) and female (orange berries), both adorned with beautiful silvery green leaves. It blooms in the spring with berry harvest in the fall. The tiny thorns protect the fruit from birds and insects, but also make harvest difficult. Oil can be extracted from the seeds, fruit, and branches, but the seed oil contains the highest concentration of nutrients to repair your skin cells and help the skin moisturize from within. The bottle is 30ml/1oz, glass, amber colored to protect from light. The lid is a rubber squeeze dropper with a glass tube. The label is plastic coated to improve readability after exposure to oil on the hands. The color is a rich, slightly orange golden yellow. The smell is mild, but earthy with a hint of evergreen. It's faintly reminiscent of dried hay or pine, but in no way strong enough to make the user smell like a horse at Christmas. The scent dissipates after application. It absorbs quickly and without feeling sticky or greasy. It repels water slightly when washing hands. Uses & benefits: Face, body, scalp and hair. Do not ingest. Add 2-3 drops and massage the desired area. You may mix the oil with your favorite essential oils, add a few drops to your favorite lotion. You can also add it to your conditioner, but start with a minimal amount and then add more as needed to prevent adding too much. Rich in essential fatty acids Omega 3 (32%, Omega 6 (34%), Omega 9 and the rare Omega 7 and antioxidants to reduce wrinkles and fine lines, heal burns and wounds, nourish skin, hair and nails. This oil also has more than 190 nutrients and phyto-nutrients. The Vitamin C content of this oil is 12 times higher than oranges! More benefits are listed on the product's page. The bottle is 60ml/2oz, glass, amber colored to protect from light. The lid is a rubber squeeze dropper with a glass tube. The label is plastic coated to improve readability after exposure to oil on the hands. The color is a pale, golden yellow. The faint scent dissipates after application. It absorbs quickly, without feeling sticky and is mildly oily. It repels water mildly when washing hands. Uses & benefits: Face, body, scalp and hair. Do not ingest. Add 2-3 drops and massage the desired area. You may mix the oil with your favorite essential oils, add a few drops to your favorite lotion. You can also add it to your conditioner, but start with a minimal amount and then add more as needed to prevent adding too much. Rich in vitamins A, C, E and beta-carotene and antioxidants. Encourages healthy hair growth and will help repair split ends. Rejuvenates the skin and helps to avoid wrinkles. Hydrates, softens and improves damaged skin such as burns, scars, stretch marks. Helps treat eczema, psoriasis, and dermatitis. Suitable for all skin types, especially for dry and damaged skin. More benefits are listed on the product's page. The bottle is 60ml/2oz, glass, amber colored to protect from light. The lid is a rubber squeeze dropper with a glass tube. The label is plastic coated to improve readability after exposure to oil on the hands. The color is a nearly clear pale yellow. The smell is not of pumpkins as I'd expected. It is very faintly reminiscent of a freshly mowed field. The scent dissipates after application. It absorbs slowly and is a bit oily. It repels water very well when washing hands. Uses & benefits: Face, body, scalp and hair. Do not ingest. Add 2-3 drops and massage the desired area. You may mix the oil with your favorite essential oils, add a few drops to your favorite lotion. You can also add it to your conditioner, but start with a minimal amount and then add more as needed to prevent adding too much. Rich in omega 3 and 6 (essential fatty acids), vitamin E, zinc, and antioxidants and is high in iron, magnesium, potassium, phosphorus, manganese and copper. Known for faster hair growth (here's an example), retaining moisture, fighting free radicals and maintaining a youthful appearance. It will improve skin tone, help wounds heal more rapidly, fight acne and help with skin renewal. More benefits are listed on the product's page. Legitimacy: When purchasing online, especially natural ingredients, it's easy to be concerned about the quality and legitimacy of the product(s) being sold. I noticed that each of the oils were all yellow in color of varying shades and that the smell was quite similar. This had me concerned as to the possibility of each oil actually being the same oil diluted. Therefore, I chose to delay my review by a month to test all three oils to verify they were in face different. Ideally, I'd had a lab and could've thoroughly tested them, but I am just a cautious consumer. What I discovered is unfounded paranoia. The Sea Buckthorn was the most aromatic, but also the fastest to absorb so only mildly water repellant. The Carrot Seed oil was second on absorption and the least water repellant despite the slower absorption. The Pumpkin Seed Oil was the slowest to absorb and the most water repellant. Each bottle had differences in all areas therefore they can not be the same oil. Price: I've purchased a variety of essential oils and cosmetic ingredient, however as I've never purchased these oils to know how valuable they are, I can not say whether or not they are priced fairly for their size. However, considering the difficulty of extracting oil from such small seeds or from a thorny plant such as with the sea buckthorn, I'm sure the price is justified. Recommendation: Would I buy these oils myself when they run out? YES. They are pricey, but will last a long time and I found their ability to moisturize to be potent and effective. I've been using Almond Oil, but I'm going to switch for awhile as these seem to last longer on my skin. I liked all three, each without issues of any kind even with my sensitive skin. I will say that if you're having difficulty determining which one to purchase, go with your oil needs. Each have different benefits and I found that each had different levels of oil absorbency. For lighter needs and fast absorbency, go with Sea Buckthorn. For heavier needs and extended water repellency, go with Pumpkin Seed Oil. For somewhere in-between, go with Carrot Seed Oil. At the least, order one and try it. When you do, return here and leave me a comment. I'd love to know your thoughts! ALLERGY ALERT!!! There is always the possibility of a reaction to anything new applied to your skin. ALWAYS patch test multiple time in different areas across several days before applying to large areas of your body, especially sensitive and prominently visible areas such as the face. It is best to dilute essential oils with a carrier oil (such as almond oil if you're not sensitive to nuts) rather than to use full strength. Products were provided at no cost to me in exchange for an honest review via my blog and social media. Some links are affiliate links where I RECEIVE commission at no cost to buyers. Thank you for supporting my blog.